If you have any questions or suggestions you are welcome to join our forum discussion about Trend Trading Guidelines. In many of the previous articles we’ve mentioned that betting against the market is a high-risk game and almost always has one outcome for the inexperienced trader – heavy losses. Entering with-trend positions is the safest way for a trader to basically “live to trade another day” and earn as much experience as possible while minimizing the possibility of wiping his account. Having said that however, we must note that because trading in general carries a big risk, it applies to with-trend trading as well. Therefore we will dedicate this article to discuss with-trend trading and hopefully provide some useful tips. Strong trends impose different difficulties to traders. For example, when the market suddenly breaks out with large trend bars, this causes many less experienced market players to panic. The price’s fast acceleration catches many wrongfully-positioned traders by surprise, not allowing them to reduce their exposure or tighten their stop fast enough. For example, in a strong bull trend, as the market reaches a previous swing high, many market players will expect a reversal. However, such attempts during strong trending movement usually fail and instead evolve into bull flags. When the market enters a bullish channel, it would most often provide us with weak buy signal bars that are pretty tricky to benefit from. They will force us to buy at the top of the bullish channel, which is a low-probability trade. Most of the traders avoid such trades due to the higher risk they impose, but those who have experience with them will definitely enter positions. Low-probability trades carry a higher risk, but also have the potential to yield much bigger profits (if for example another large trend bar forms). High-probability traders who are the major part of all traders tend to avoid with-trend trades near the top of a bullish channel (or the bottom of a bearish). During strong uptrends they tend to miss most of the action as they sit back and wait for a high-probability trade, like a pullback to the moving average, after which they can go long. While sitting back, they can only observe how the strong trend continues to edge higher without any pullbacks for many bars. Keep in mind that this is not a bad thing, because each trader should remain in his comfort zone – if you are a high-probability trader, then you should wait for high-probability setups and vice versa. We know that market movement is almost never straightforward and the trend will eventually shift, providing high-probability traders with favorable opportunities to enter. No matter which type of trader you are, you should also bear in mind that the majority of successful traders are those who follow the trend and not bet against the market. During a bull trend, the successful market players are either long, or they abstain from entering. During a bear trend, respectively, they are short or flat. Very few are capable of being consistently profitable by going against the market and you should assume that you are not one of them. There are many suitable points a trader can find during a strong trend for a stop entry order. First of all, the fact itself that the market is moving in a distinctive direction should be enough of a reason to enter with at least a small portion from your usual trading size. A trader should also feel comfortable to enter a very strong uptrend by buying on a stop above a prior swing high. You can buy a pullback in a strong bull spike during an uptrend as well, but not if the spike was a climax, because that would commonly signify trend exhaustion. As we’ve said before, climaxes most often end with the trend reversing or entering a trading range. Another reasonable entry would be to buy a wedge bull flag pullback in an uptrend, or a pullback to the moving average from a higher high. All these scenarios are mirrored in a downtrend. The more experienced traders would also use limit orders to improve their performance, but because these orders involve higher risk due to their nature of betting against the current market movement, they are not suitable for the majority of novice traders. Here are several entry opportunities. You can buy at the close of the first bearish bar in a bull spike or below the low of the prior bar. You can also buy at the the trend line of a bull trend (as it tends to act as a support), or at a prior swing low (also tends to act as a support level). When the price finds itself near the moving average, there are several possibilities. You can buy at or below the prior bar in a bull flag at the moving average. You can also buy on the close of the first bearish trend bar that closes below the moving average, as shown on the screenshot below. 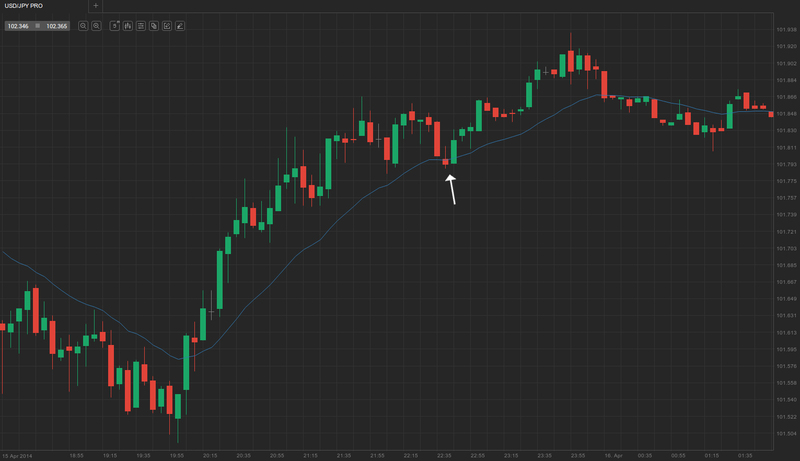 Moreover, if the trend was so strong that it had not pulled back to the moving average for more than 15 bars, after which it retreated to it, you can buy at the moving average and scale in as the price continues to fall. You should exit the entire position at the price level of the first entry, but in case the uptrend is very strong, you should aim to lock in profits at a test of the trend’s high. Alternatively, you can buy at or below a swing low or a lower low at the bottom of a trading range or after a bullish reversal that is supposedly preceding the formation of a new bull trend. You can also consider to buy at a certain amount of pips below the trend’s high, depending of the market’s recent (in some cases daily) movement. A 15%-25% pullback from the trend’s high would be reasonable. This means that if the price has seen a daily fluctuation of 100 pips, as the price begins to pull back from the trend’s high, you can buy at 15-25 pips below the extreme (the trend’s high). Another thing worth considering is that if the market has recently made a pullback, then you should use that pullback as a guideline at which point below the trend’s extreme to enter. If the market has previously pulled back by, say 50 pips, then should buy a 45-55 pip pullback from the trend’s top.